If the conduction system is dysfunctional, the QRS widens beyond 0.12 seconds. Sometimes this conduction delay is rate-dependent : the bundle branch block occurs only at higher heart rates and disappears at slower heart rates. A bundle branch block causes a delay in the depolarization of the right (RBBB) or left (LBBB) ventricle. In RBBB the QRS complex shows a second peak or R' in V1. Check V1 when QRS > 0.12 sec. When the "terminal force" of the QRS in V1 is below the baseline (i.e. QS wave), a LBBB is the most likely diagnosis. When the "terminal force" of the QRS in V1 is above the baseline (i.e. RSR' wave), it's a RBBB. If the QRS > 0.12 sec. but the morphological criteria of LBBB or RBBB do not apply, it is called 'intraventriculair conduction delay', a general term. In a LBBB, the left ventricle is depolarized later than the right ventricle. Left bundle branch Block on a 12 lead ECG. Another example of Left bundle branch Block on a 12 lead ECG. 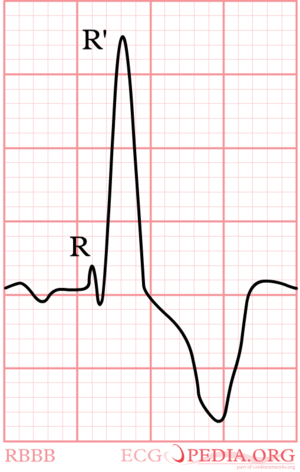 In a LBBB, the last depolarization wave is in the left ventricle. This wave is directed away from V1. On the ECG, V1 will show a negative complex. 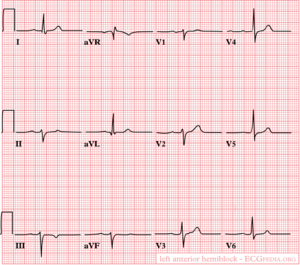 In left bundle branch block (LBBB) the conduction in the left bundle is slow. This results in delayed depolarization of the left ventricle, especially the left lateral wall. 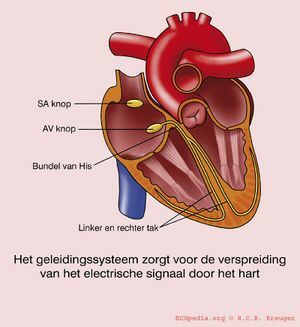 The electrical activity in the left lateral wall is unopposed by the usual right ventricular electrical activity. The last activity on the ECG thus goes to the left or away from V1. Once you remember this, LBBB is easy to understand. Diagnosis of myocardial infarction in LBBB can be difficult. QRS duration greater than or equal to 120 ms in adults, greater than 100 ms in children 4 to 16 years of age, and greater than 90 ms in children less than 4 years of age. 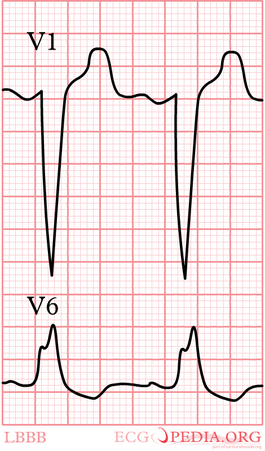 Broad notched or slurred R wave in leads I, aVL, V5, and V6 and an occasional RS pattern in V5 and V6 attributed to displaced transition of QRS complex. Absent q waves in leads I, V5, and V6, but in the lead aVL, a narrow q wave may be present in the absence of myocardial pathology. R peak time greater than 60 ms in leads V5 and V6 but normal in leads V1, V2, and V3, when small initial r waves can be discerned in the above leads. ST and T waves usually opposite in direction to QRS. 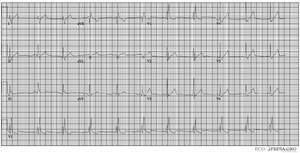 Positive T wave in leads with upright QRS may be normal (positive concordance). 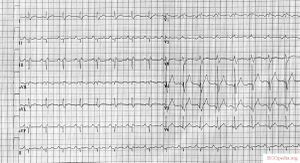 Depressed ST segment and/or negative T wave in leads with negative QRS (negative concordance) are abnormal. The appearance of LBBB may change the mean QRS axis in the frontal plane to the right, to the left, or to a superior, in some cases in a rate-dependent manner. QRS duration between 110 and 119 ms in adults, between 90 and 100 ms in children 8 to 16 years of age, and between 80 and 90 ms in children less than 8 years of age. Presence of left ventricular hypertrophy pattern. R peak time greater than 60 ms in leads V4, V5, and V6. 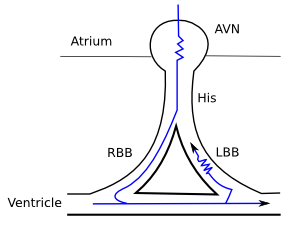 Absence of q wave in leads I, V5, and V6. Also a narrow initial R wave in V1 has been linked with a reduced response to CRT. In general when the QRS is wide and the definitions of LBBB and RBBB are not met, the term NIVCD (non-specific intraventricular conduction delay) is used. Also read right bundle branch block. Diagnosing myocardial infarction in RBBB is not as difficult as in LBBB. QRS duration greater than or equal to 120 ms in adults, greater than 100 ms in children ages 4 to 16 years, and greater than 90 ms in children less than 4 years of age. 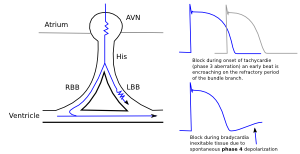 rsr′, rsR′, or rSR′ in leads V1 or V2. The R′ or r′ deflection is usually wider than the initial R wave. 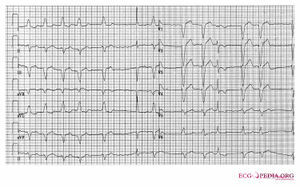 In a minority of patients, a wide and often notched R wave pattern may be seen in lead V1 and/or V2. S wave of greater duration than R wave or greater than 40 ms in leads I and V6 in adults. Normal R peak time in leads V5 and V6 but greater than 50 ms in lead V1. Of the above criteria, the first 3 should be present to make the diagnosis. When a pure dominant R wave with or without a notch is present in V1, criterion 4 should be satisfied. Incomplete RBBB is defined by QRS duration between 110 and 120 ms in adults, between 90 and 100 ms in children between 4 and 16 years of age, and between 86 and 90 ms in children less than 8 years of age. Other criteria are the same as for complete RBBB. In children, incomplete RBBB may be diagnosed when the terminal rightward deflection is less than 40 ms but greater than or equal to 20 ms. 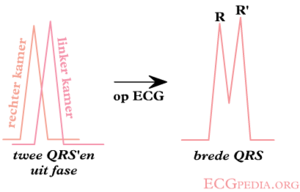 The ECG pattern of incomplete RBBB may be present in the absence of heart disease, particularly when the V1 lead is recorded higher than or to the right of normal position and r′ is less than 20 ms. The terms rsr′ and normal rsr′ are not recommended to describe such patterns, because their meaning can be variously interpreted. In children, an rsr′ pattern in V1 and V2 with a normal QRS duration is a normal variant. Frontal plane axis between −45° and −90°. qR pattern in lead aVL. R-peak time in lead aVL of 45 ms or more. QRS duration less than 120 ms. These criteria do not apply to patients with congenital heart disease in whom left-axis deviation is present in infancy. In left anterior fascicular block the anterior part (fascicle) of the left bundle is slow. This results in delayed depolarization of the upper anterior part of the left ventricle. On the ECG this results in left axis deviation. The QRS width is <0.12 seconds in isolated LAFB. Frontal plane axis between 90° and 180° in adults. Owing to the more rightward axis in children up to 16 years of age, this criterion should only be applied to them when a distinct rightward change in axis is documented. rS pattern in leads I and aVL. qR pattern in leads III and aVF. Right bundle branch block is more common, because the right bundle has the longer refractory period. Left bundle branch block accounts for about 1/3rd of cases. The image explains LBBB due to phase 3 and phase 4 aberration. 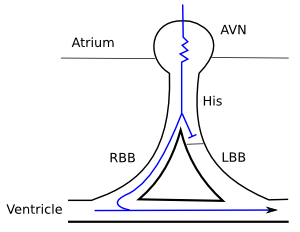 Phase 3 aberration occurs when conduction fibers receive a new impulse, before they have fully repolarized. A premature impulse is encroaching on the refractory period of the bundle branch. This is a physiological phenomenon. This can sometimes be observed at the start of paroxysmal supraventricular tachycardias or in a long-short sequence in which the refractory period of the long sequence is prolonged. This is also called Ashman phenomenon. A small increase in rhythm resulting in aberrancy due to an abnormal response of tissue that has diminished excitability. This is the most common mechanism for sustained aberrancy during tachycardia. 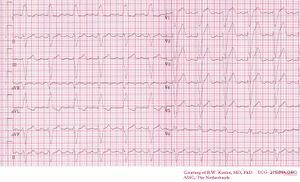 The sequence of QRS widening that is often observed is phase 3 aberration in the first premature beat. This can leave the left bundle (for example) refractory for the next complex. This next beat is conducted by the right bundle and once it reaches the apex, it is conducted retrograde by the left bundle. This can continue until a new premature ventricular complex causes a compensatory pause and 'resets' the system. Complete or marked conduction delay in a bundle branch leading to complete ventricular activation over the contralateral bundle branch. This page was last edited on 19 December 2012, at 06:08.